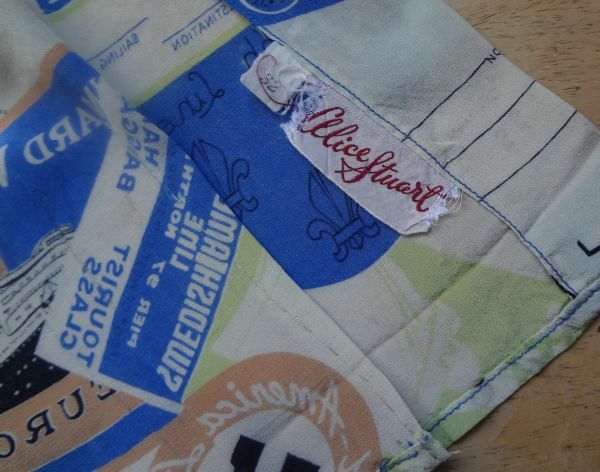 This swatch is on the reverse side of a very lovely vintage skirt. You are looking at one of the best examples of reweaving I’ve ever seen. Here is the front of the same section of the skirt. Don’t bother looking for the mends as they are completely invisible. Reweaving is one of those skills that sounds simple to acquire, but is, in fact, quite difficult to do properly. I know because I’ve tried, with varying success. 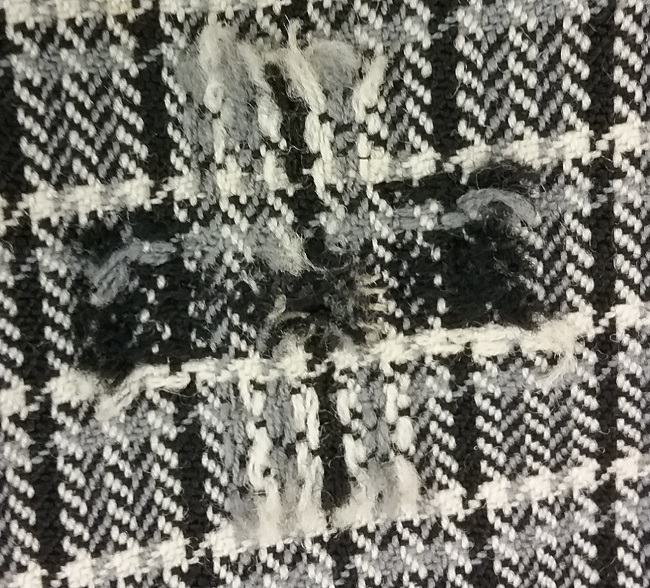 I would never attempt to reweave such a complicated and finely woven plaid. In this enlargement you can better see how the reweaver used a needle to replicate the pattern. And in the center is the hole. Reweaving is still practiced today, but be prepared to pay for the service. This is highly skilled work. 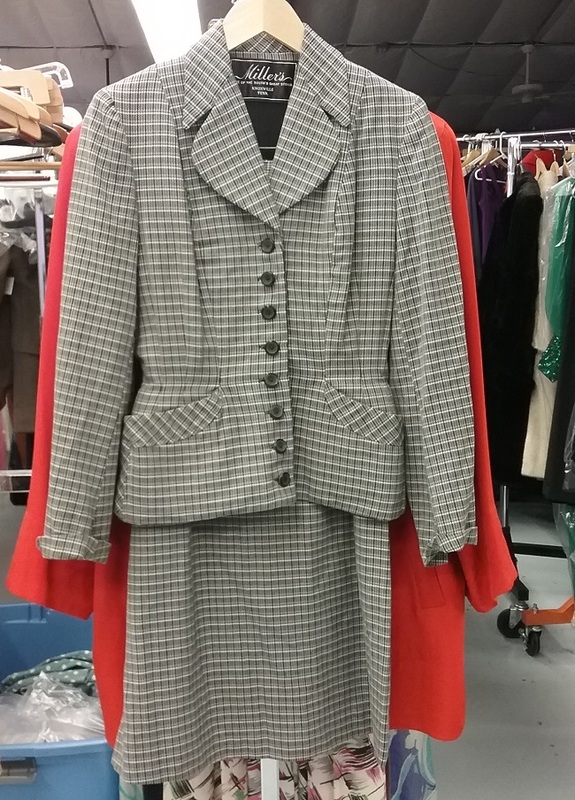 And here’s the suit, part of the collection at Style and Salvage, a local vintage business. I love visiting and watching them work because there is always something new to see and to learn. I can see why the original owner had this suit repaired. 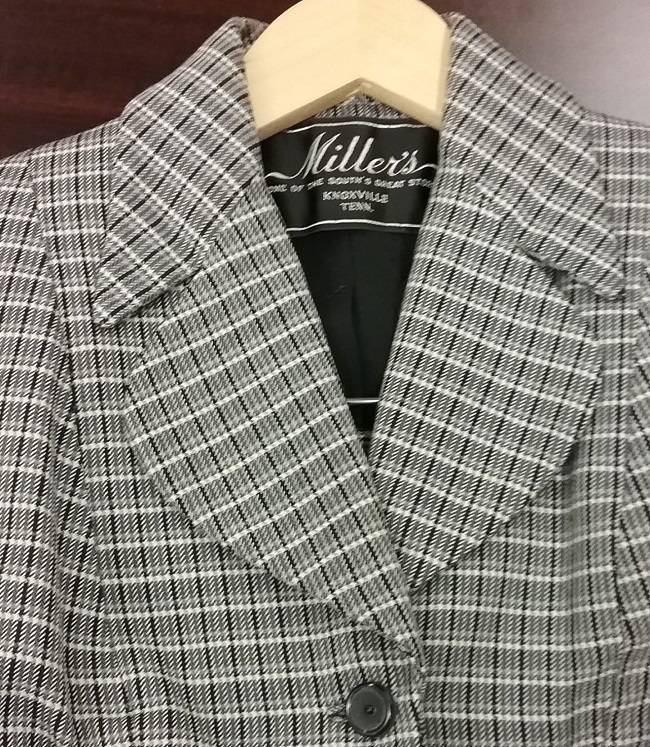 It is a great set, and she bought it at Miller’s, THE department store in Knoxville, Tennessee. And this was during the time that people did not see their clothing as being disposable. Repairs were considered part of the upkeep of nice things. 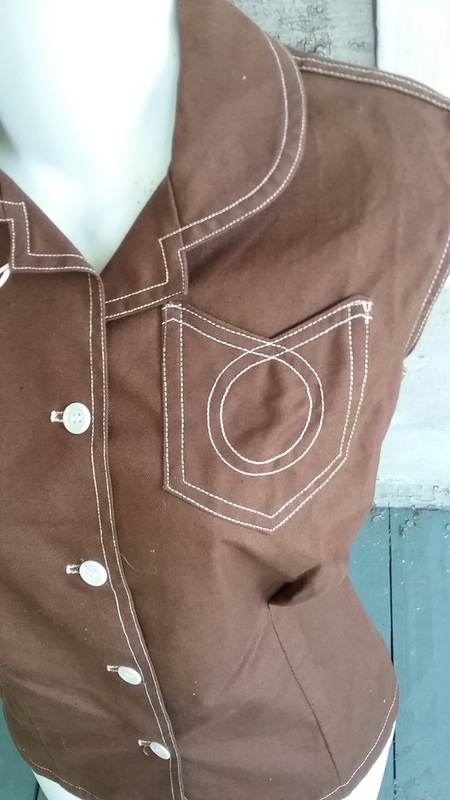 The curve of the collar is repeated in the pockets. I’m not familiar with the maker, Elynor, but a trip to the trademark site told me the company first used the name in 1927. 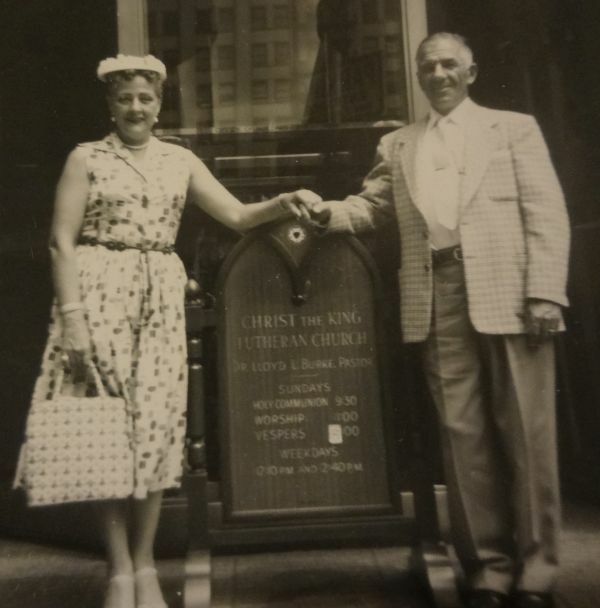 It was one of the many quality suit makers in the New York Garment District. 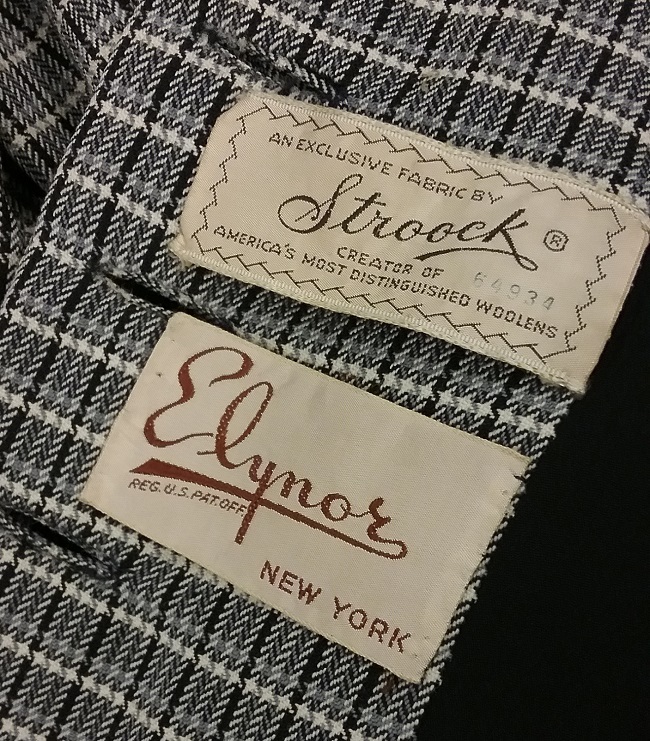 Stroock was, as the label clearly proclaims, a fine woolen cloth manufacturer. The history of the company dates back to 1866 as a maker of blankets of fine fibers including cashmere and vicuna. Thanks to Mel and Jeff at Style and Salvage for allowing me to share this great suit. Over the years I’ve written a lot about White Stag. It continues to be one of my favorite American sportswear companies, and with good reason. It represents a time when quality in clothing was more important than quantity. I’ve seen dozens of White Stag pieces from the 1940s through the 1960s over the years, and in only one instance can I say a piece looked worn out. Until the 1960s, White Stag made most of their clothing from the same material they used to make tents and other canvas outdoors items. I’ve seen White Stag rucksacks that were made from the same fabric as a canvas coat I have. The fabric was sturdy and remarkably color-fast. I recently acquired this White Stag blouse from one of my favorite vintage sellers, Past Perfect Vintage. I was eager to add it to my collection because I have some other coordinating pieces from White Stag. And that is part of the joy of collecting sportswear. I never know when a matching piece to things I already have will pop up. And as luck will have it, I found an ad for this line from 1953. It does not show any pieces in brown, but the ad copy reveals that these items were available in “eleven sunbright colors.” White Stag used brown quite often, sometimes combining it with turquoise and black. I am hoping to someday find that nifty carry-all. The top-stitching adds to the sporty look. 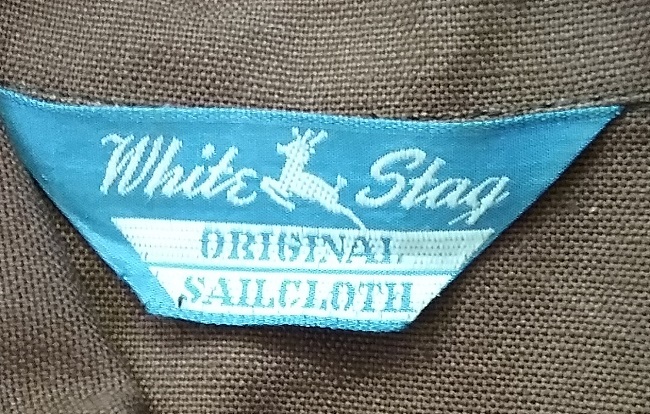 It’s another common feature of White Stag clothing from the 1950s. 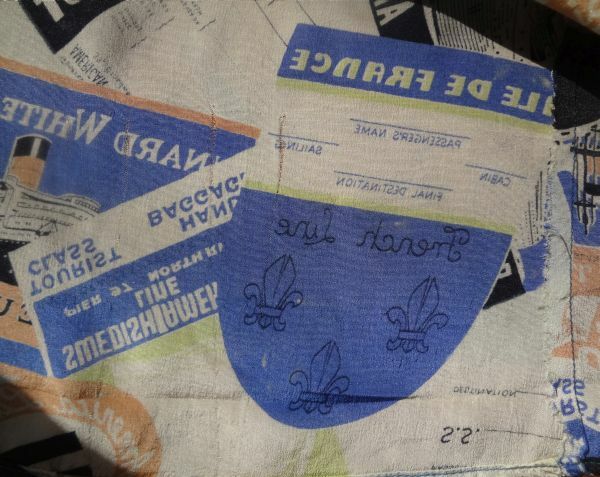 I have, on occasion, been accused of putting too much store in the labels found in vintage garments, but when combined with a dated ad, all the guesswork of when certain labels were used is erased. I know without a doubt that this label was used in 1953. 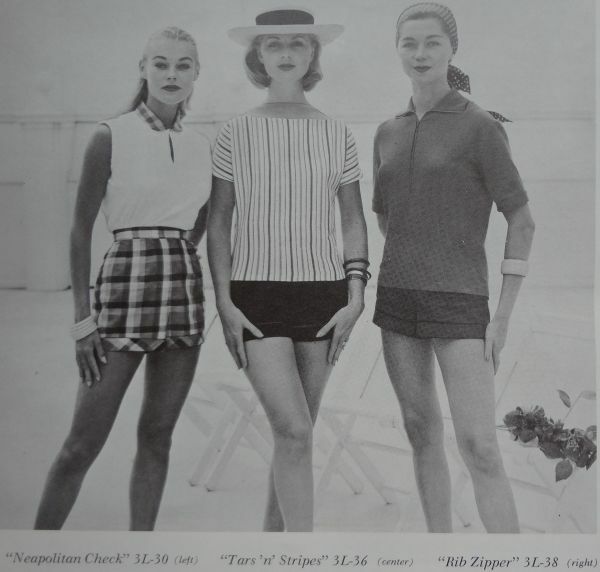 A lot can be learned from old catalogs. This one from Jantzen was not made for the consumer, but for the merchants that would be buying Jantzen products for their stores. This particular catalog is for junior clothes, and I’m sure there were others for clothing for men, misses, and children. Of course there were plenty of swimsuits. 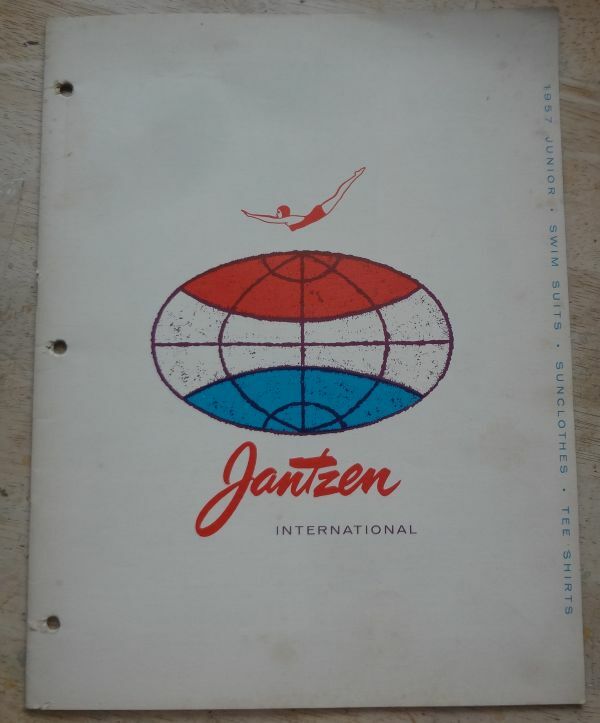 After all, Jantzen was primarily a swimsuit company. But what is interesting is how much of the catalog is devoted to other sportswear. 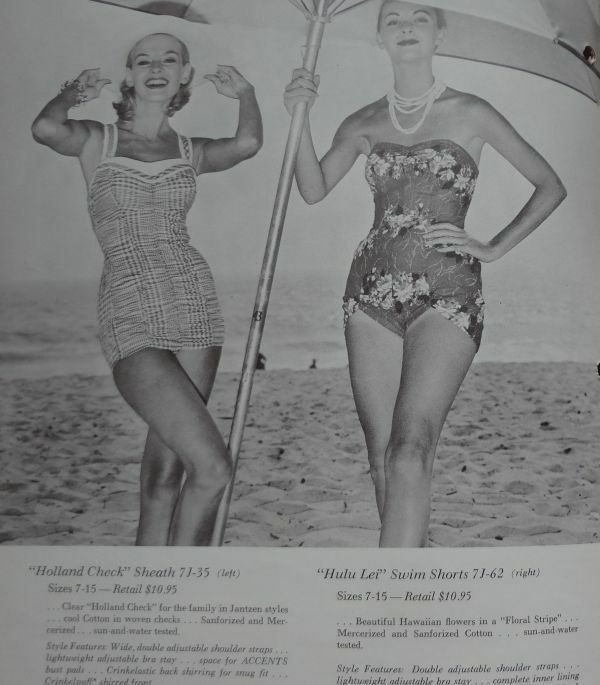 But before I get to the sportswear, I want to focus in one the swimsuit on the left. 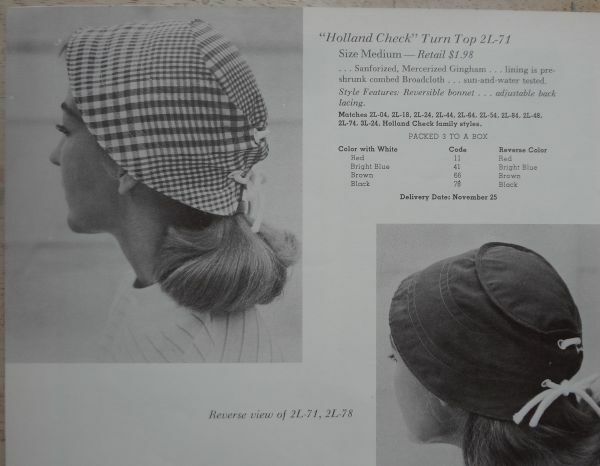 This model was the “Holland Check” Sheath, with retailed for $10.95. (Add in inflation, and this suit would be $93.50. Jantzen was not cheap.) 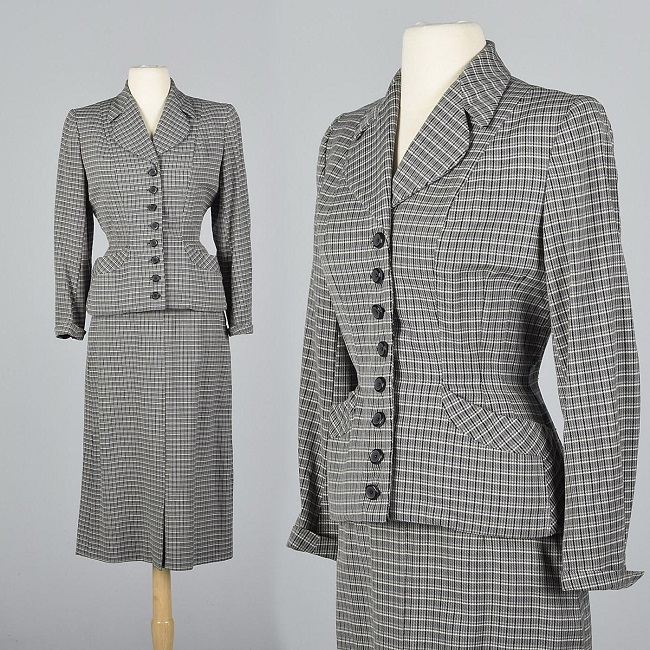 In the late 1950s, and into the early 60s, plaids and checks were very popular. 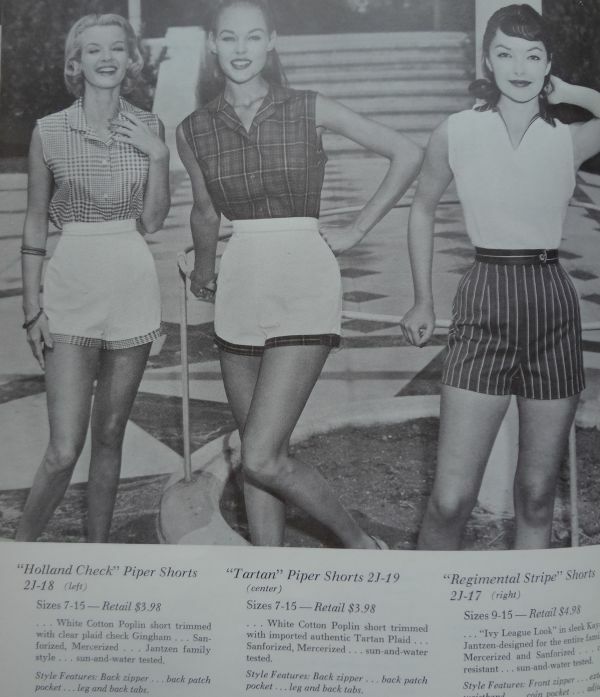 This catalog features several plaid designs. You can’t really tell what the plaid looks like here, but I do admire the way the designer used the print as part of the design. 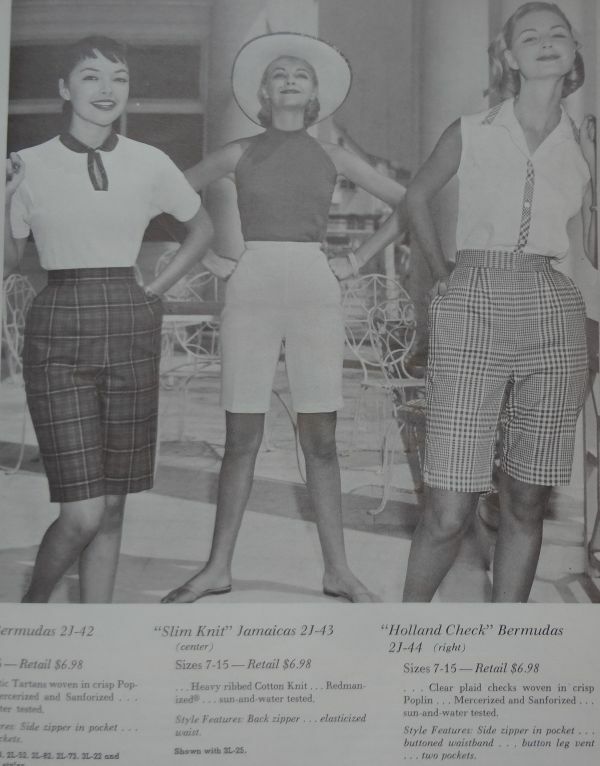 Here you see the Holland check as trim on shorts and in a sleeveless top. And best of all, here is the same check in a fabulous reversible cap. The check was available in white with red, blue, brown, or black. 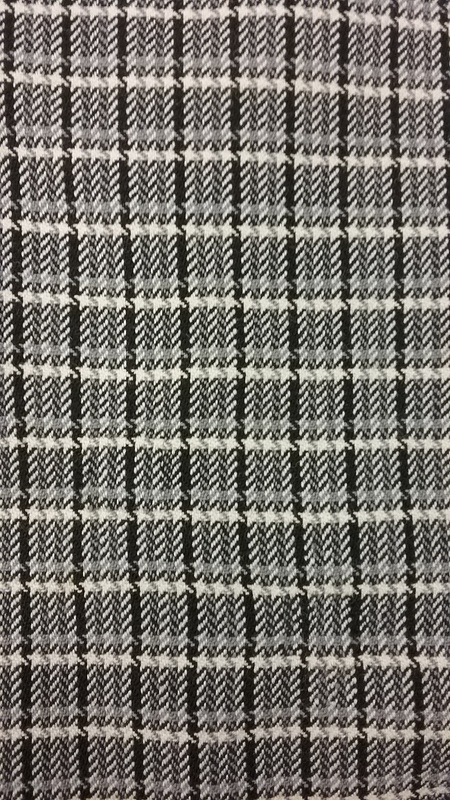 I’d never heard of “Holland Check” but it looks an awful lot like Prince of Wales plaid. A store would pick which pieces to sell and it’s very unlikely that any one store opted to sell the entire line. 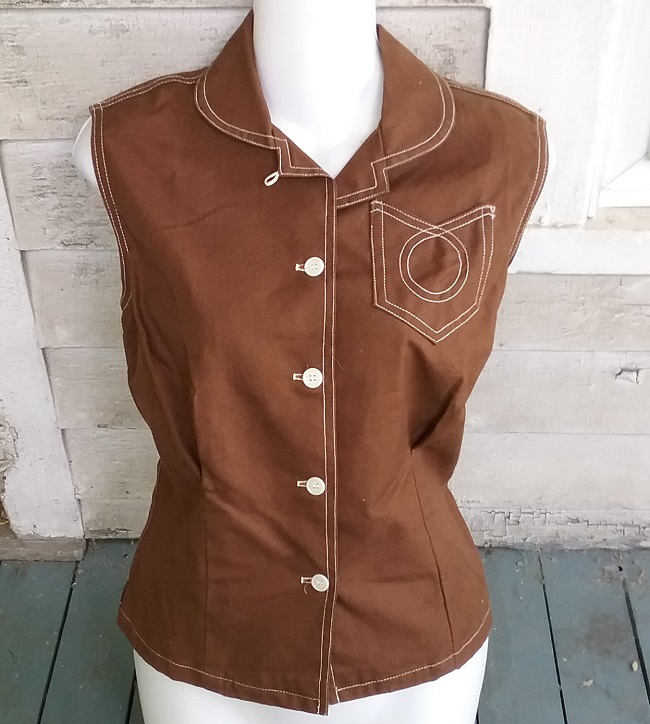 I can remember shopping in department stores in the late 1960s and early 70s, and it was common for stores to be selling the same brands, but to be offering entirely different pieces. As a collector, it is nice seeing all the options available in the same print. 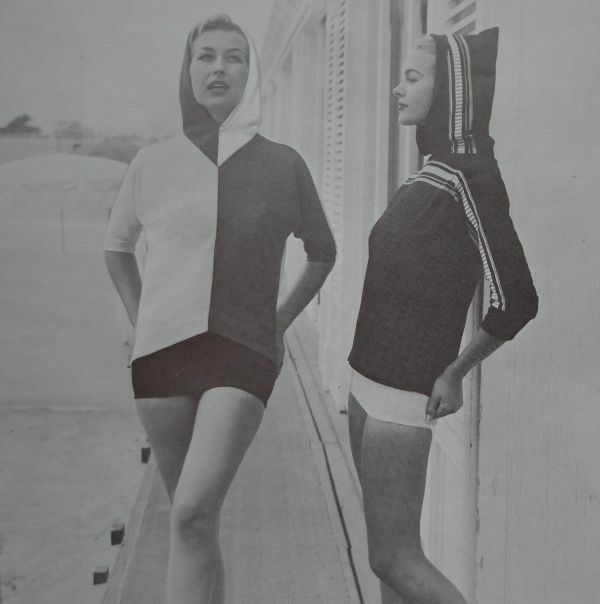 It’s hard enough finding great old sportswear garments, but how challenging it would be to try and assemble all the pieces of a particular line. Unless one gets lucky, that is, the way I did with a matching line from Tabak of California. There was a real “Italian Look” evident in many of the garments. The influence of Emilio Pucci, perhaps? There were also references to the nautical influence, as in “Tars ‘n’ Stripes”. And here’s even a nod to the ever popular middy blouse, though for some reason they chose to spell it “midi”. 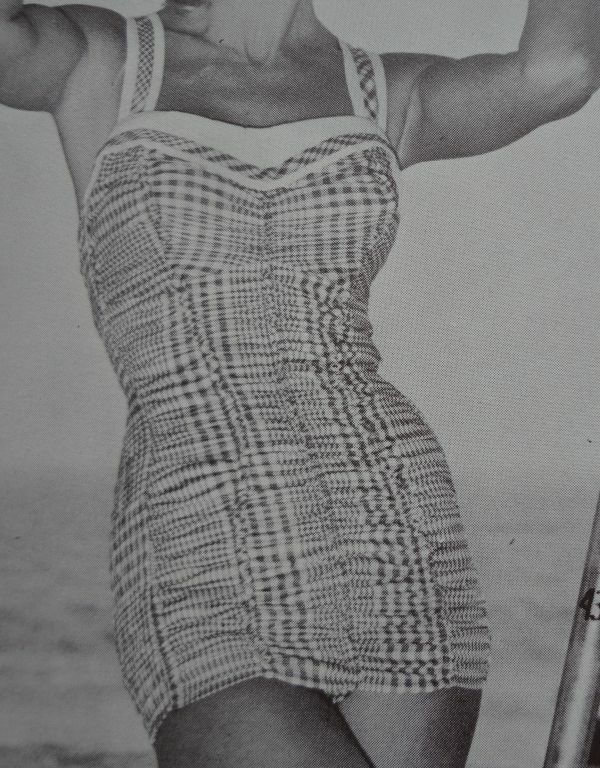 Because these were junior swimsuits, targeted toward a teen consumer, Jantzen offered “Accents”, a bra pad. 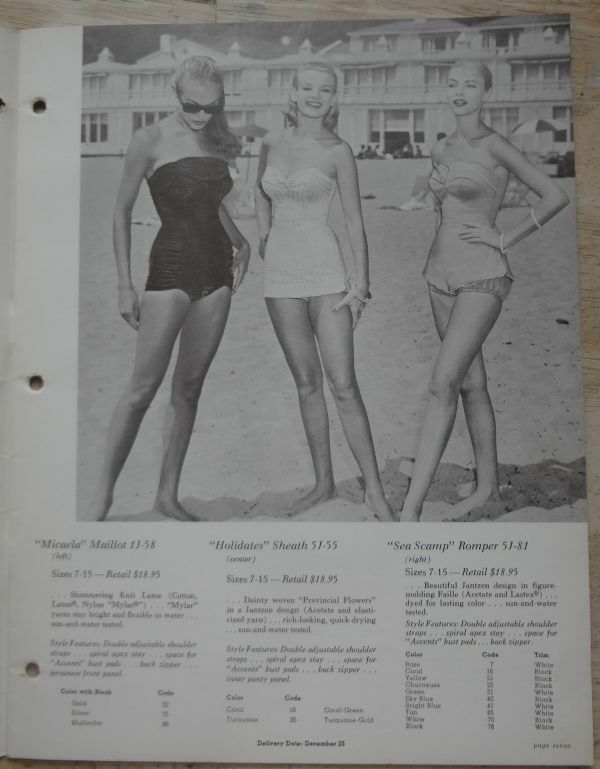 The description of most of the swimsuits in this catalog mention that there is “space for ‘Accents” bust pads” in the suit. I’ve got to wonder if there was an actual place in which to insert these pads. Anybody know? One thing that really makes the clothes and accessories of the years immediately following WWII is color. During the war the limitations to fashion went way beyond rationing. Because they were made from chemicals, many dyes were in short supply due to their usefulness in the war effort. In the US, shoes were pretty much limited to six colors: black, three shades of brown, navy, and white. Some writers have suggested that part of the limitation of colors might have been an effort to make shoes less desirable, and to make women less likely to want to buy the new shoes. There may be some truth to that, and I might suggest that the styles were not exactly attractive either. They were sturdy and made to last. Aesthetics were an afterthought. But after the war ended, color exploded across fashion. Some of the very best prints ever conceived were printed on post WWII rayons and silks. Color didn’t end there, though, and shoes and handbags were also full of fantastic colors. 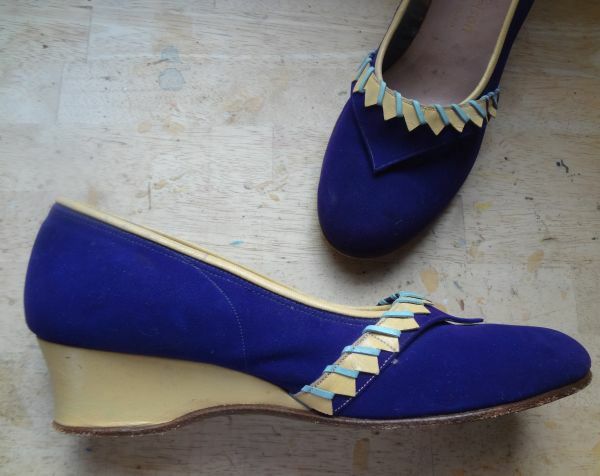 I found these super wedge shoes last weekend, and immediately fell in love with the color combination of purple, light yellow, and pale sky blue. 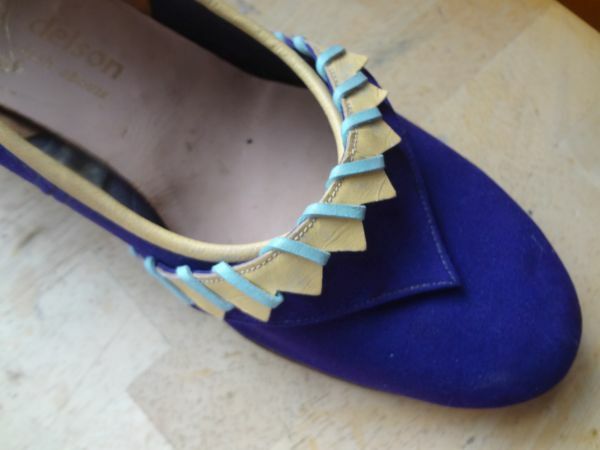 Just that little touch of blue turned these shoes into something really special. 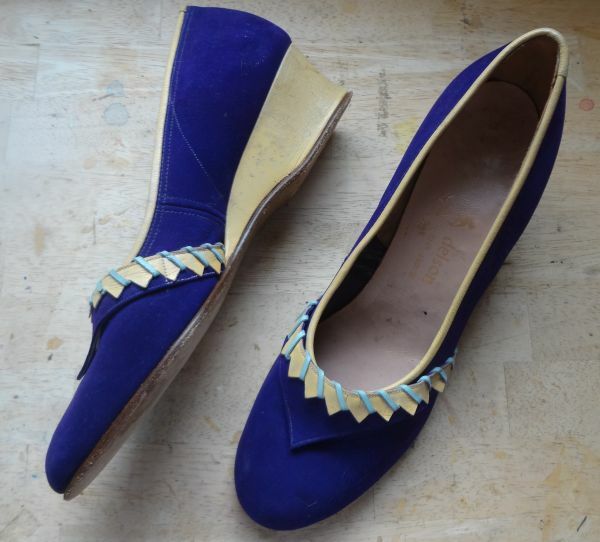 The wedge hell was introduced by Ferragamo in 1936, and it remained a practical heel through the war years. 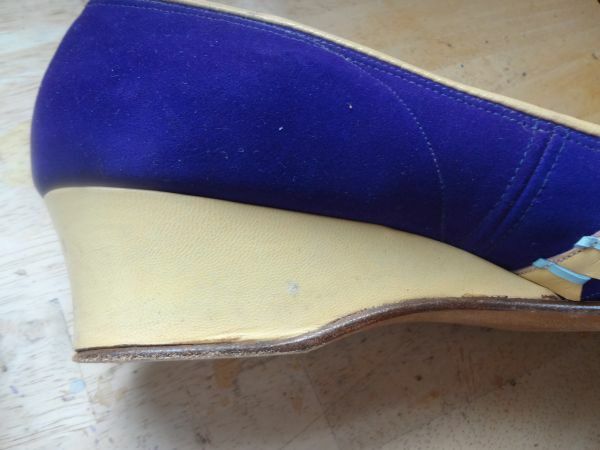 It allowed for easy walking, and the stability make wedges more comfortable than a conventional heel. After the war ended, the wedge heel remained popular. For the most part, it was used for more casual shoes or shoes for work. Sandals often had wedge heels during the postwar period. I spent an hour or two this afternoon researching when wedges were popular. What that means is that I lost myself in copy after copy of magazines from the 1940s and early 50s. Judging by the frequency of wedges featured in ads and editorial content, starting about 1952 the wedge heel started to lose popularity. A devotee of the wedge could still find them in 1954, but the style was fast waning as the stiletto came on strong. 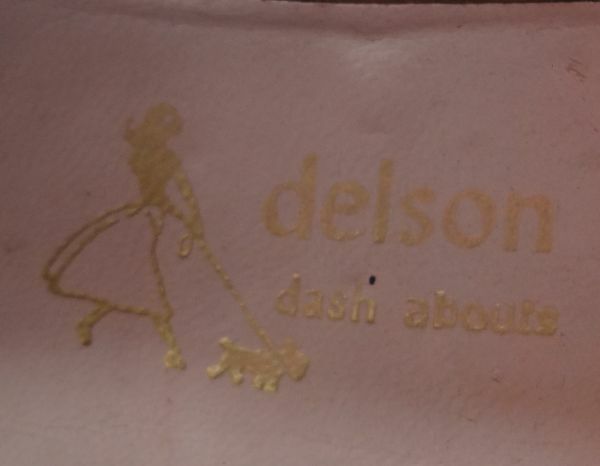 The brand is Delson Dash Abouts, a label I don’t remember ever seeing. My search through my magazines did not produce an ad for the company either. I did find a very few online references, the earliest being a newspaper ad in 1950. There was also a note in a book on copyright holders that the label belonged to Bird & Son, Inc. The last mention I’ve found was in a 1960s ad. The Scottie on the label had absolutely nothing to do with the purchase of these shoes. 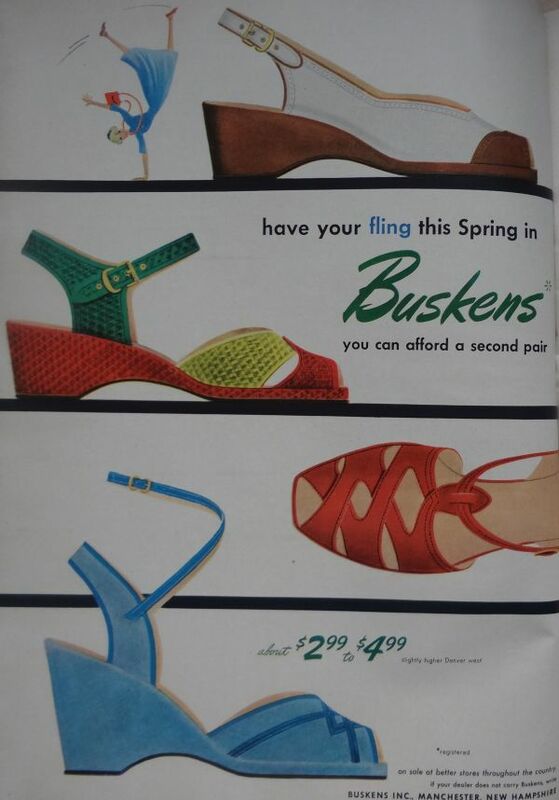 As I said, I did not turn up an ad for Delson Dash Abouts, but advertisements for colorful wedge shoes were common from 1946 through about 1952. 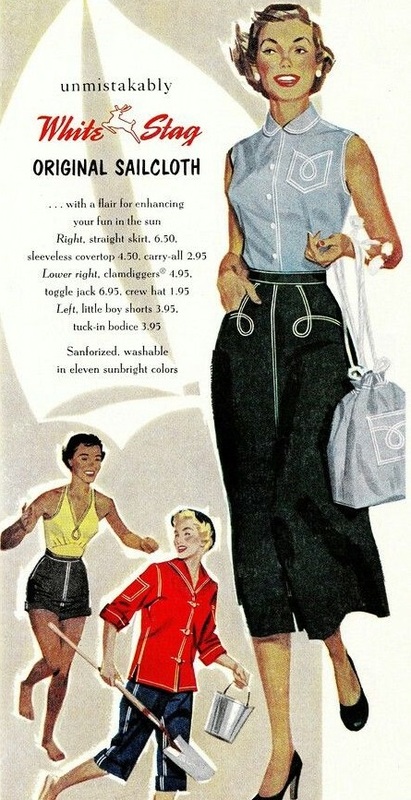 An example is this 1951 ad from Buskins. One thing that really determines whether or not I add an object to my collection is the condition, especially if it is a fairly common garment. 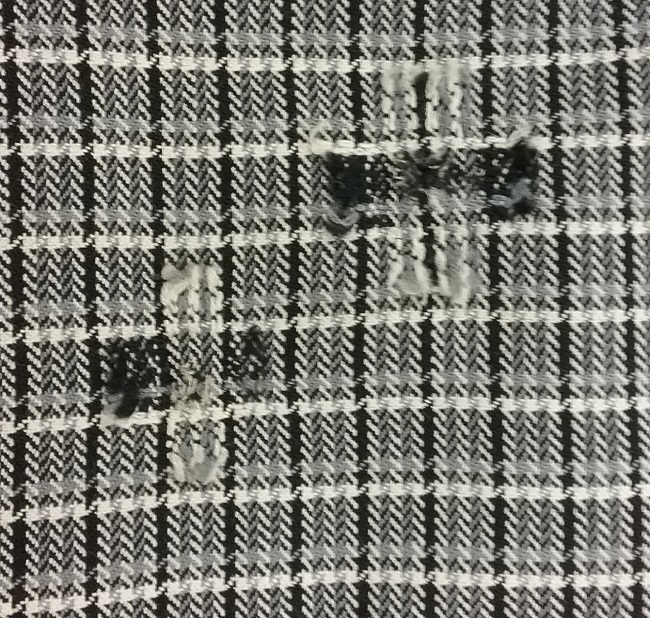 But sometimes a piece that is damaged crosses my path and I have to decide if the garment is special enough to disregard the damage. 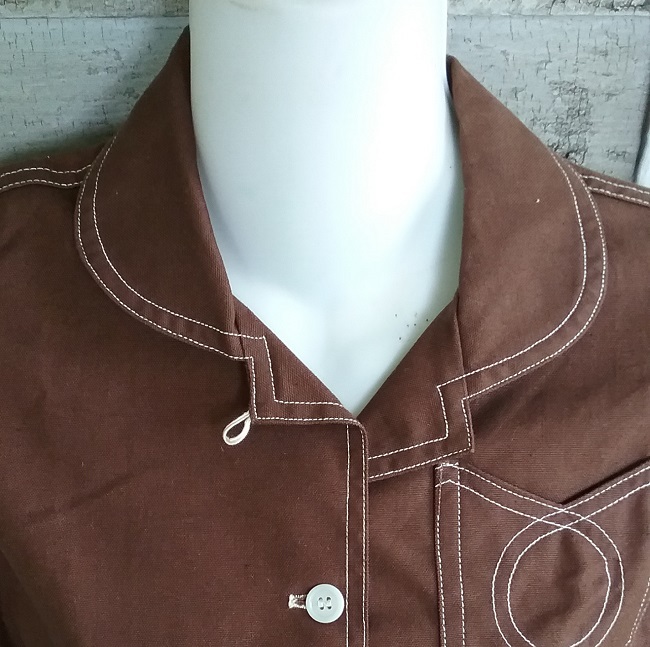 Such was the case of this rayon blouse from the late 1940s or early 50s. 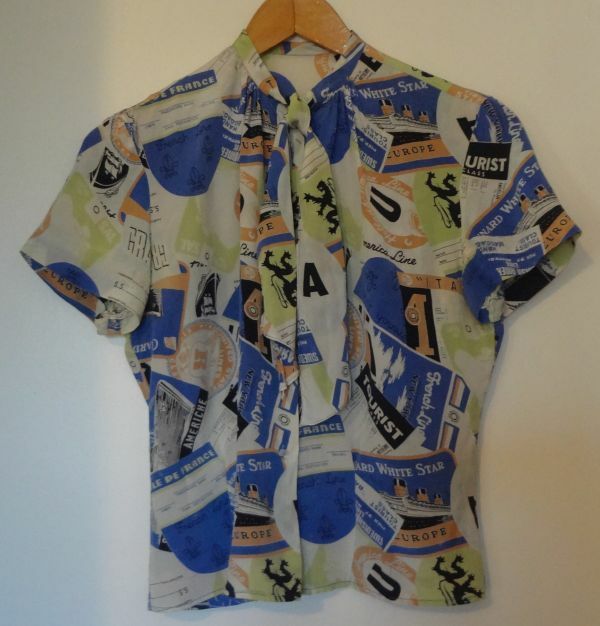 I loved the print, which is made up of ocean liner stickers. I loved the blue, black, and lime green color scheme. I loved the style. But it had numerous problems. The price was reasonable, so I bought it anyway. Look carefully at the two photos above to spot the differences. The bottom photo is before a few temporary repairs. There were a series of darts that released into fullness above the waist. 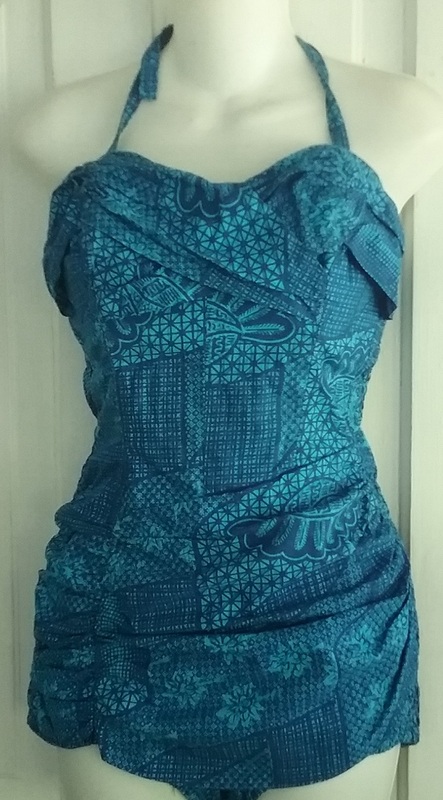 This was a design trick that helped a tucked in blouse look neater because it reduced the bulk around the waist. 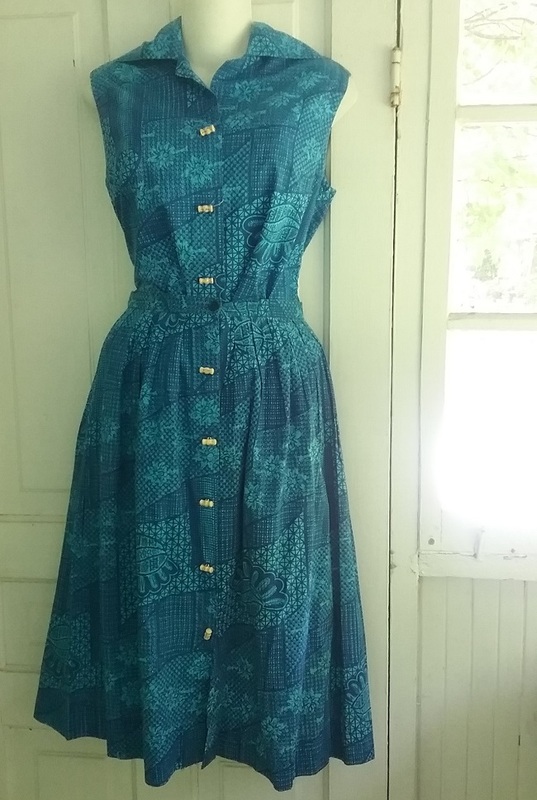 A previous owner had taken out all the darts, and then she hemmed the blouse about an inch and a half. 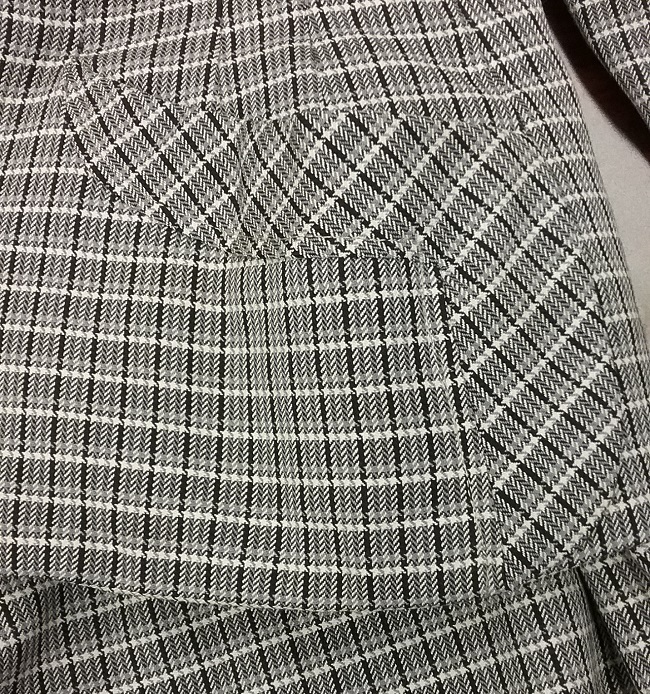 Here you can see the stitch marks that had been removed, and the fold line where the blouse had been hemmed. Note that the stitch lines of the darts had been strained, which probably explains that they had been removed following a weight gain. 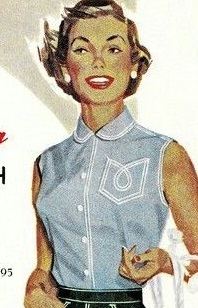 The shorter length could possibly have occurred late in the 1950s when over-blouses became popular. Because the seamlines were somewhat compromised, I decided not to restitch the darts permanently. Instead, I lightly basted them in place so that when displayed they had the shape of the original design, but with less stress on the dart seams. The seams around the bottom of both sleeves had been repaired, with much of the underarm seams being broken. Again, I used basting as these seams were also in fragile condition. 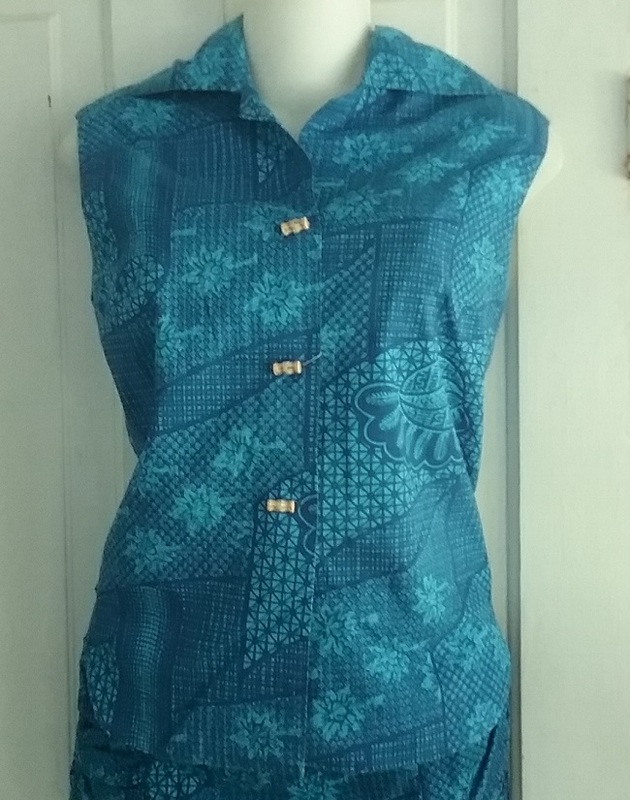 After the repairs, the blouse is still fragile, but is strong enough for display. It has the look of its original self. The ad above is from September, 1951, around the time my blouse was made. 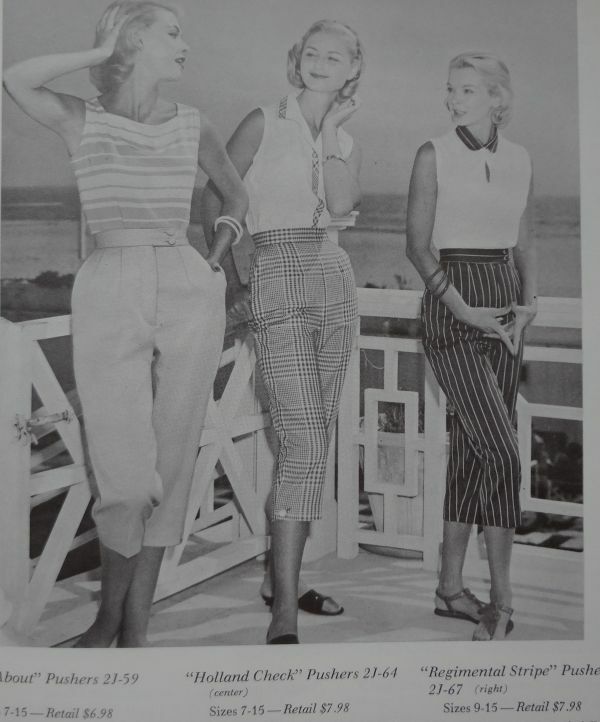 One thing I love about researching old brands it that it allows a few guilt-free hours looking through vintage fashion magazines. I did not expect to find an ad for my blouse, as I would have remembered this print from previous browsings. But I felt confident that I would find ads for Alice Stuart. 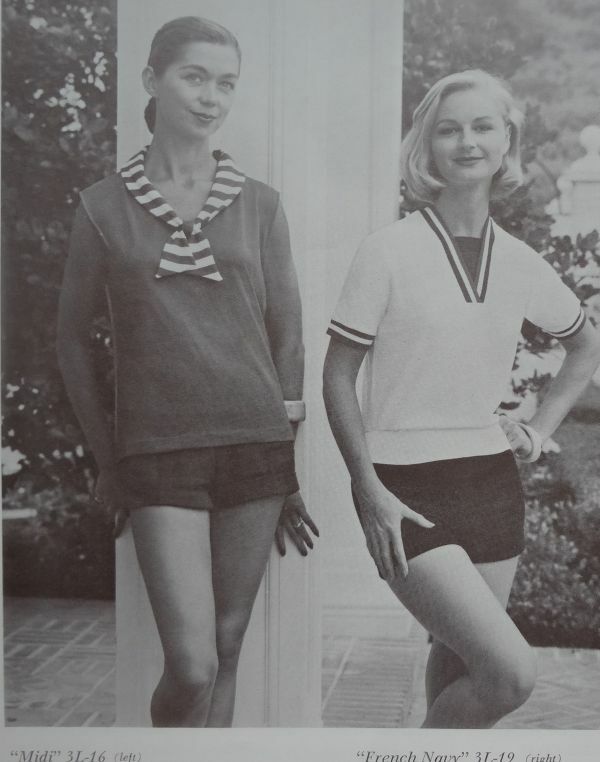 Blouses were a very big deal in the 1940s and 50s, with there being dozens of companies that made blouses exclusively. 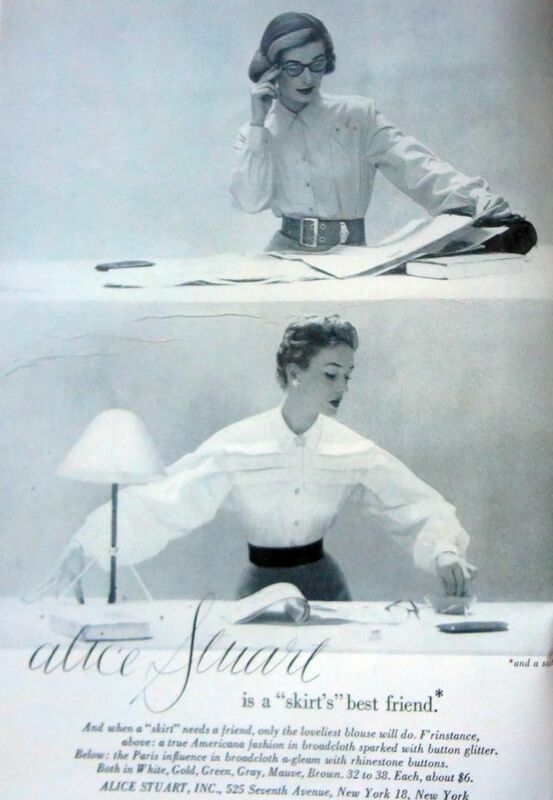 Every issue of magazines targeted toward the career girl, like Glamour and Mademoiselle, had plenty of blouse advertisements including those for Alice Stuart. 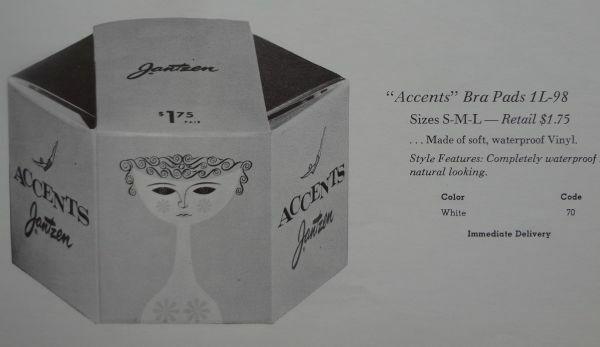 From the ad above you can see that the blouses were made by Alice Stuart, Inc. By 1956 the label had become part of the Jonathan Logan dressmaking empire. In that year Jonathan Logan registered the trademark, which the application claims that the label was first used in 1942. That sounds about right, though sometimes the information contained in trademark applications involved a bit of guesswork by the applicant. 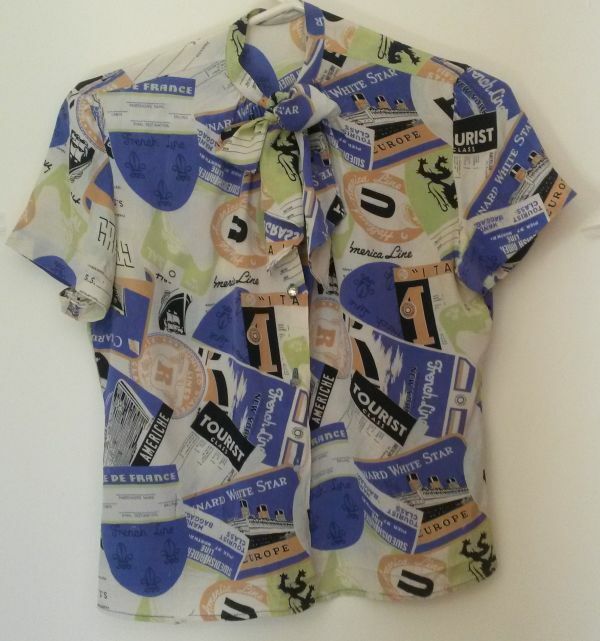 I have no idea when the label was discontinued, but a search on ebay produced styles from the 1980s. I’m in the process of organizing and making good digital copies of my photograph collection. Actually, I’m waiting for a big snowstorm that will force me to actually stay at home and accomplish the task, but that’s another story. Anyway, I have been reviewing and categorizing each photo, and when I came to this one, I did a bit of a double-take. Mrs. Stock’s dress looked very familiar. Then it hit me. I have that dress. 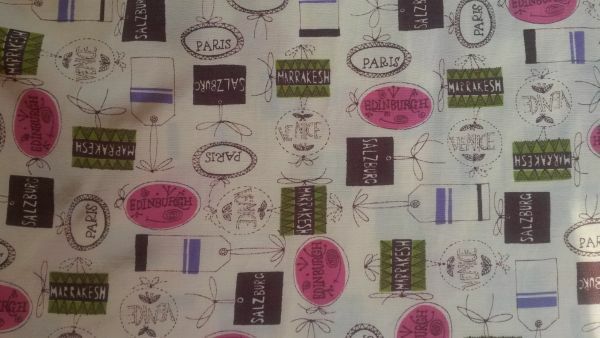 The dress is a rayon print with travel tags: Paris, Salzburg, Marrakesh, Edinburgh, and Venice. It’s 1950s in every way possible, from the pink and olive green used in the print, to the fonts of the words, to the line drawings. 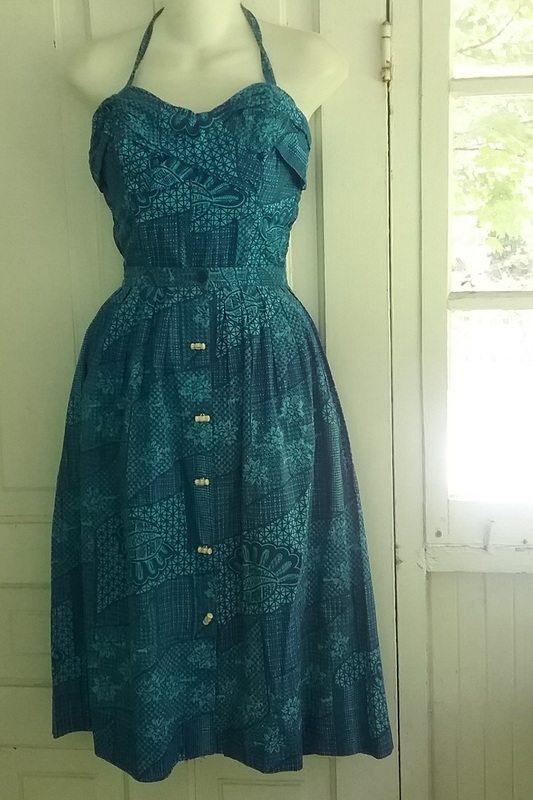 And the design of the dress – actually a skirt and blouse – is also typical of the 1950s. 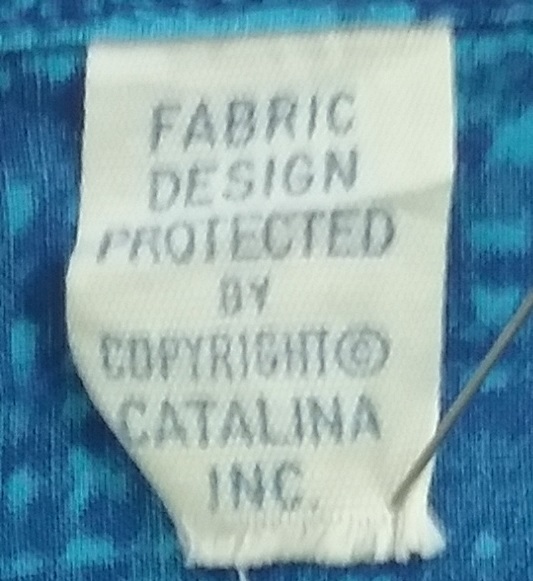 My dress has no label, but it was commercially made. 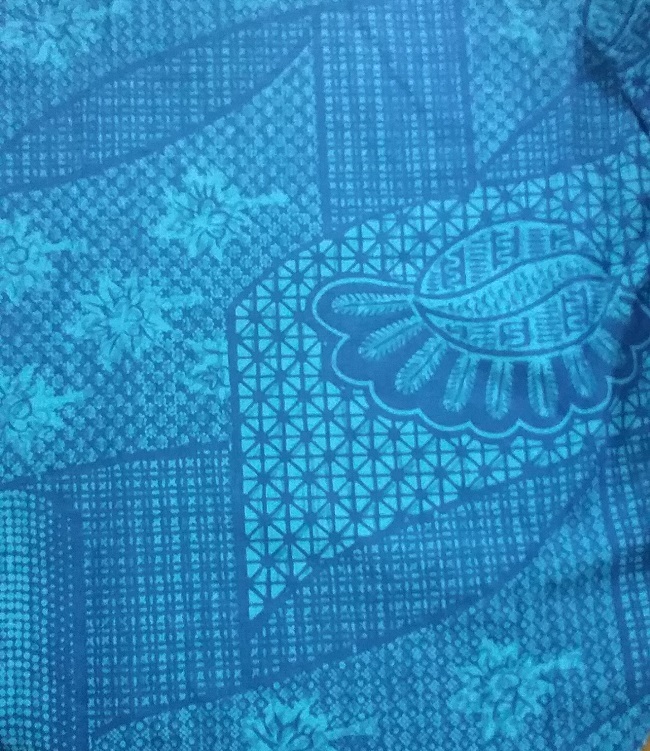 I’ve seen the print in another colorway, and in a different type garment – a much fuller skirt. 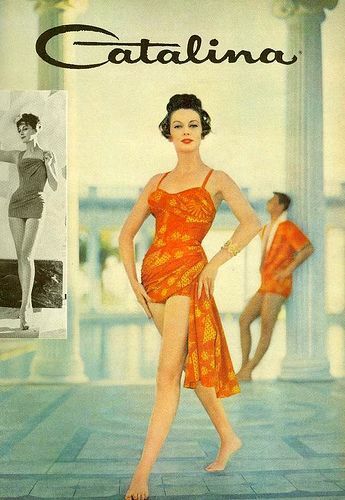 That’s not uncommon, as a fabric design was often not only used by more than one company, and it might have been offered to home dressmakers as well. Here’s a closer look at Mrs. Stock and her dress. 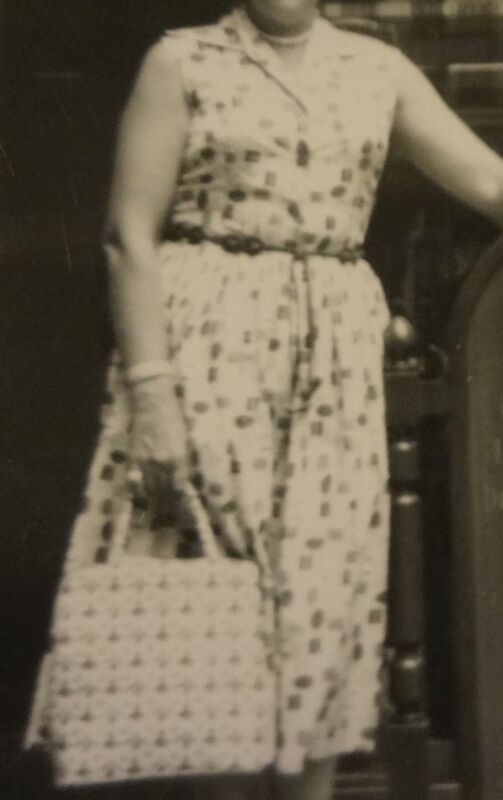 I love that we can see how she accessorized the dress, with her pearls, bracelet, and especially, the belt. It’s the only piece that does not match!